Rise from the depths to the surface with this gig-ready stomp. 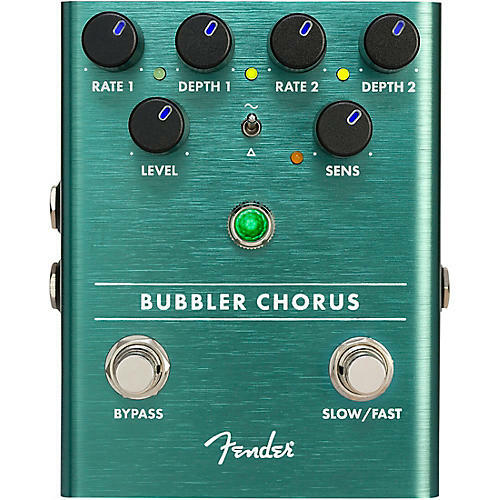 Designed by Fender's in-house team of experts, the Bubbler Chorus is an all-original Fender circuit. To ensure this pedal is performance-ready Fender let musicians kick it around, took their feedback to heart and refined it. The chassis is crafted from lightweight, durable anodized aluminum, and the Amp Jewel LED gives your pedalboard the classic Fender look. The LED-backlit knobs show your control settings on a dark stage at a glance. Bring the Bubbler Chorus to your next gig or session and add the sound of an ultra-flexible, true analog chorus to your sonic toolbox.